This type of gym equipment might be just what you're looking for, especially if you are an old-school weight trainer who likes blasting out some reps. It's a style of training that has proven itself to be highly effective over the years, allowing you to perform multiple exercises in within a very small space. Stands, Cages, Half racks & more. Build an amazing home gym! If you own a gym or studio, some form of weight rack is almost a necessity. Not only does it give your clients access to perform the best exercises with safety, but these products are unrivaled in terms of value for a single piece of gym equipment. They offer so many quality movements without taking up too much space, and are perfect for rehabilitation and isolated muscle group training while still offering the variety you won't find in a single station or other dedicated peice of gym equipment. What separates a Rack or a Cage from a Smith Machine? Is this the right type of gym equipment for me? Do I need experience to use a Smith, Cage, Rack or Stand? This versatile piece of weight training equipment is often called a power cage because at first glance, it’s just a solid steel frame. Also known as a weight rack or gym rack, a power racks primary purpose is to provide safety when lifting free weights, stability when performing bodyweight exercises and flexibility through the use of a wide range of accessories. It features four upright posts, a frame at the top, some feet for stability and a couple of horizontal bars on each side. Although the footprint of a power rack can vary in size (some are as little as 1.2m square, but others are big - as much as 2.5m square), height doesn’t vary too much - usually between 1.8m and 2.1m. All racks offer you a bunch of optional accessories such as chin-up bars, pegs (for storing weight plates) and so on, but add a barbell and a bench to your cage, and now you’re taking things to a whole new level. With a large number of holes in the uprights to allow for adjustable accessory and safety bar positioning, a power cage is also an excellent choice when performing limited-range exercises, as the spotter bars and J-Hooks can be moved to suit the exercise you are performing. This provides the safety of a professional training environment as you can rack your barbell when lifting heavy weights, which is especially important if you’re working out on your own, as it will prevent injury in the event you drop the bar. It does all of this while providing the convenience of a full range of motion for many different exercises. 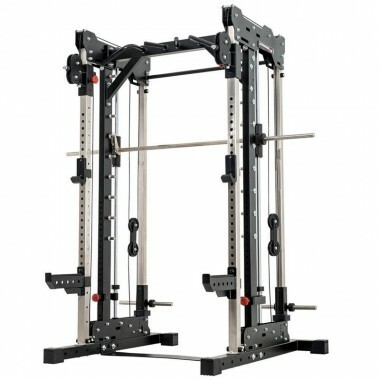 It’s this simplicity and flexibility that makes a power rack such an excellent investment. A Half Rack or Squat Rack only has two uprights. They normally have a more compact footprint, but to allow you to perform all the main compound movements. Just like the power racks, they have adjustable spotter arms for training safely without a partner. 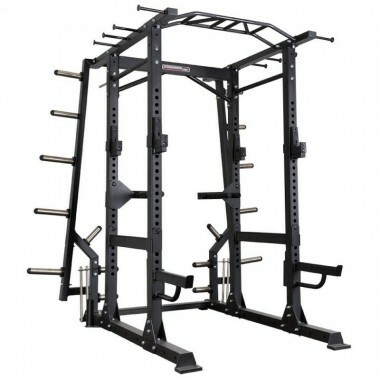 Squat Stands are like similar to a Squat Rack, except they are not joined together. This is great for places where floor space is limited. They can be packed away at the end of the workout. A Smith Machine has a barbell that operates on guide rails for that extra added degree of security. It has several lockout points, so if you can only partially complete a rep, you can safely lock the bar in place. For bodybuilders, they are excellent for isolating muscle groups. Since you don’t need to stabilise the barbell, you can focus more on working the muscle. A rack, cage or Smith is the ideal base on which you can build an amazing home gym. You will see that there are many optional extras, like a lat pulldown attachment, that will turn your barbell lifting cage into a complete home gym system. Plus all our equipment have the safety spotter systems so that you can train at home by yourself with complete safety. So you will have no excuse for not pushing yourself to the limit and achieving results! Safety & quality is the key in regards to safety, it is no use having these safety features if they and the entire rack are poor quality in both design and build. That is why we only stock reputable international brands – Barbarian Line, Megatech, ATX, Ironmaster, and Powertec. All these brands have established track records around the World and there are loads of videos, reviews, and testimonials that support this. Compound movements like squats and bench press typically exercise that you will be lifting the heaviest weights. So it is important that your equipment is up to the task. Squats, in particular, involve suspending a weight at shoulder position, so a poorly designed or built rack can lead to disastrous consequences. Even if you are just a beginner, and not lifting a very heavy weight, investing in a better quality rack, Smith or cage is a smart move. 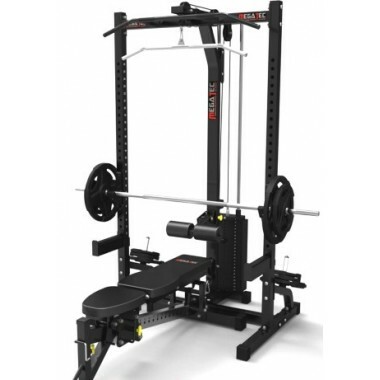 A Megatec or Powertec cage may be a bit more expensive than most entry-level racks, but they will not only accommodate your strength gains with ease, there are many features and optional extras that will make your weight training experience more enjoyable. For the gym owner or personal trainer, the Barbarian Line offers you strength and durability of racks and cages at under half the price. They have been tested and certified for commercial use by European standards – so their weight load capacities and specifications have been independently verified, not pulled out of thin air by the manufacturer. Plus they have been in Europe for twenty years and are more popular now than ever. If you are looking for something special for your gym, then the ATX range is a must. 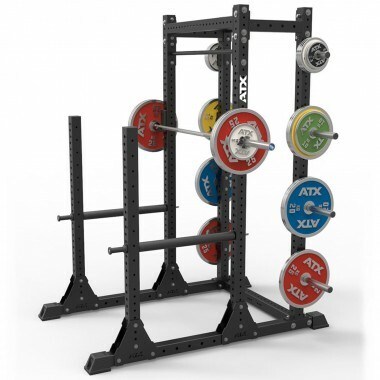 This line was developed for the European market as a cost-effective alternative to the imported US power racks and squat stands. Not only do they match them on price, they also have them covered in terms of specifications and build quality. All we need is your requirements and our experienced sales staff can point you towards the right cage or Smith for your purpose. No matter what your budget, floor space or experience level, we have the right product to cater to your needs.